Is the “Conventional Wisdom” All Wrong? The Ebola virus, which has caused deaths from high fever and bleeding in African outbreaks, can also infect without producing illness, according to a new finding by African and European scientists. The possibility of asymptomatic infection was only suggested in earlier studies, they said in last week’s issue of The Lancet, a medical journal published in London. Now they said they had documented such infections for the first time. 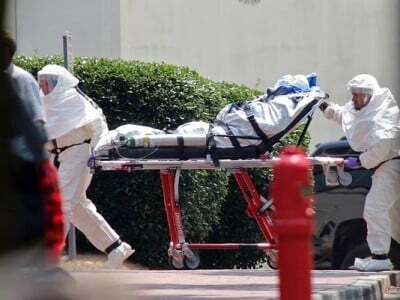 They found that the Ebola virus could persist in the blood of asymptomatic infected individuals for two weeks after they were first exposed to an infected individual. How much longer the virus can persist is unknown. If people can be carriers without showing symptoms, it means control might be more difficult. “This degree of containment would be virtually impossible if symptom-free carriers posed a significant threat of infection,” Dr. Alan G. Baxter of Newtown, Australia, wrote in an editorial in the same issue of The Lancet. An immediate effect is to raise the need to reassess health policy about one of the most virulent viruses known and to determine how often healthy carriers transmit it, said the scientific team headed by Dr. E. M. Leroy of Franceville, Gabon. Dr. Leroy’s team studied 25 individuals who never developed symptoms although they lived with family members and cared for them without using gloves and other precautions in two outbreaks in Gabon in 1996. Using standard virologic techniques, the scientists from Gabon, Germany and France said they could not detect the virus in the blood of the healthy contacts. But Dr. Leroy’s succeeded by using a technique known as polymerase chain reaction to grow the tiny amount of virus present. Here is the study published in Lancet. And here is the editor’s comment. But Western governments and scientists have repeatedly said that Ebola carriers can only infect others if they are showing symptoms. So they need to adjust their strategies to account for potential contagion from people who aren’t showing any symptoms. The important points are that virus-laden bodily fluids may be aerosolized and inhaled while a person is in proximity to an infectious person and that a wide range of particle sizes can be inhaled and deposited throughout the respiratory tract. Being at first skeptical that Ebola virus could be an aerosol-transmissible disease, we are now persuaded by a review of experimental and epidemiologic data that this might be an important feature of disease transmission, particularly in healthcare settings. Many body fluids, such as vomit, diarrhea, blood, and saliva, are capable of creating inhalable aerosol particles in the immediate vicinity of an infected person. Cough was identified among some cases in a 1995 outbreak in Kikwit, Democratic Republic of the Congo, and coughs are known to emit viruses in respirable particles. The act of vomiting produces an aerosol and has been implicated in airborne transmission of gastrointestinal viruses. Regarding diarrhea, even when contained by toilets, toilet flushing emits a pathogen-laden aerosol that disperses in the air. There is also some experimental evidence that Ebola and other filoviruses can be transmitted by the aerosol route. Jaax et alreported the unexpected death of two rhesus monkeys housed approximately 3 meters from monkeys infected with Ebola virus, concluding that respiratory or eye exposure to aerosols was the only possible explanation. Zaire Ebola viruses have also been transmitted in the absence of direct contact among pigsand from pigs to non-human primates, which experienced lung involvement in infection. Persons with no known direct contact with Ebola virus disease patients or their bodily fluids have become infected. Altogether, these epidemiologic and experimental data offer enough evidence to suggest that Ebola and other filoviruses may be opportunistic with respect to aerosol transmission. That is, other routes of entry may be more important and probable, but, given the right conditions, it is possible that transmission could also occur via aerosols. In other words, these two infectious disease experts believe that Ebola is already – in its current form – transmissible via aerosols. They therefore urge all doctors and nurses working with Ebola patients to wear respirators. We need to understand how Ebola is really spread, and then take appropriate counter-measures. It is clear that the virus is mutating. Indeed, top doctors say that – unless contained – it could eventually mutate to become airborne. And the Washington Post notes that terrorists could use Ebola as a bio-weapon. The longer the outbreak rages, the more likely such a scenario becomes. According to American nurses, the U.S. healthcare system is woefully unprepared to handle Ebola. We need an effort on the scale of World War 2, the Marshall Plan or the moon shot to contain and eradicate this modern plague.